EasyXLS™ library allows you to create Excel documents. The data in cells can be formatted using predefined formats or user-defined formats. EasyXLS can be successfully used inclusively to create large Excel files having big volume of data with fast exporting time. The first step is to create an instance of the ExcelDocument class, which is the main class for pure code-based Excel document handling. This class is the key used to create new Excel files and read Excel files. EasyXLS permits you to create Excel files without Excel installed, without Interop or any other additional software installed. It also provides a method, easy_getError, for debugging purposes, which renders information on errors or warnings that occur during writing or reading Excel files. The below example shows how to create Excel file programmatically. After that, more code samples about how to create and save Excel file from various standard data structures like DataTable, DataSet, ResultSet and List are shown. 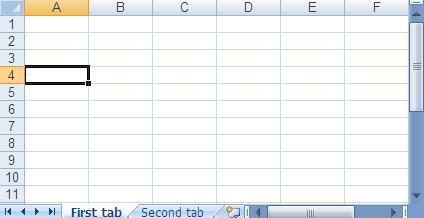 The screen shot below represents the created Excel document generated by the code sample above. The file has two worksheets (First Tab and Second Tab). EasyXLS™ enables you create new Excel sheets. How to create new Excel sheet? EasyXLS™ enables you to populate the sheets with data. The supported data types are strings, numbers, dates, booleans, errors and formulas. How to add data to Excel file? EasyXLS allows you to create Excel file from DataTable. The data can be arranged in nice formatted reports. How to create Excel file from DataTable in C# and VB.NET? EasyXLS allows you to create Excel file from DataSet. The data can be arranged in nice formatted reports. How to create Excel file from DataSet in C# and VB.NET? EasyXLS allows to create formatted Excel file from list of data. How to create Excel file from list? EasyXLS allows you to create formatted Excel file from GridView. How to create Excel file from GridView in C# and VB.NET? EasyXLS allows you to create formatted Excel file from DataGridView. EasyXLS allows you to create Excel file from ResultSet. The data can be arranged in nice formatted reports. How to create Excel file from ResultSet in Java? This code sample shows how to create XLS file. Similarly, you can create XLSX file using ExcelDocument.easy_WriteXLSXFile method or create XLSB file using ExcelDocument.easy_WriteXLSBFile method. How to create XLS file? How to create XLSX file? How to create XLSM file? How to create XLSB file?